On November 8 2013, Typhoon Yolanda (Haiyan) plowed through Eastern and Central Visayas with unprecedented destruction and devastation in recorded history with 300+kph sustained winds. Virtually destroyed every man made object and structure in its path. Infrastructure damage was severe and out of imagination. There was a total catastrophic collapse of the power generating infrastructure of the Visayas Grid. Almost every power pole has fallen, main grid supply lines crushed by the winds and generation facilities with crippling damage. When the typhoon hit, nobody outside was able to get accurate damage assessments because communications to the most afflicted areas where cut off. Unknown to the rest of the country, the people in those areas were clinging for survival with all the elements necessary for human survival- shelter, clothing, food, water, communications and power were all up rooted with the 300kph winds and subsequent tsunami like storm surge.After ten days, the telecom companies were able to fix cell sites and repeater stations but last mile electricity remained out of the hands of the general public and government first response units had to run scarce diesel generator sets at rationed intervals. The survivors had no power, fuel was scarce, working generators were flooded by the storm surge and there was simply no power. Fuel for working generators were run out by the fourth day after the storm with no significant aid or outside intervention besides spotter planes and a few brave men who cut through debris strewed highways to get to Tacloban. Relatives could not contact their loved ones in the afflicted areas as their cellphones have gone dead from days of no charging and or where lost and damaged. There was much tension as reports of whole families as being wiped out where coming in and tales of whole neighborhoods lost to the sea were the accounts survivors gave when they arrived in Manila from the airforce C-130s . A few days before the storm at Solaric HQ Makati, we just shipped some Solar panels to our Cebu client, and we were about to install two large residential installations with panels that just came in from our plant in China, this was intended for Grid tie use. Then Yolanda came in, everybody in Manila was in shock and scrambling to provide solutions to save lives, help our country and fellow men. 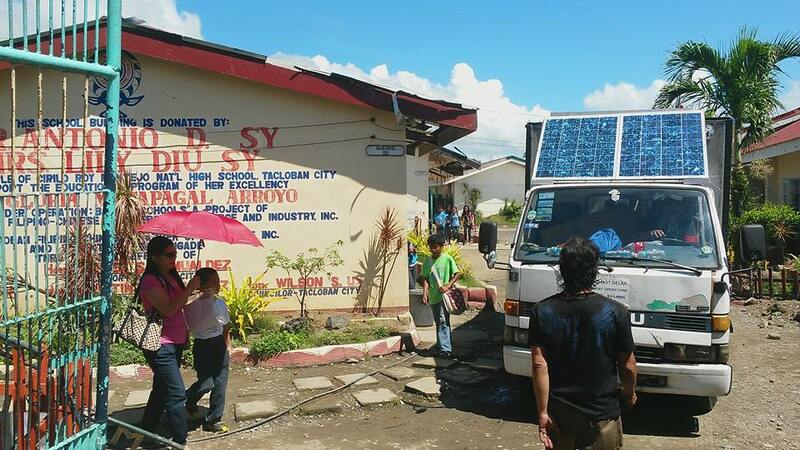 Friends and neighbors packed relief goods, hardware store owners donating all their tarp and lots of building materials, some of my buddies sent out military grade water purifying units. Then various NGOs contacted me and my sister if we know where to get generator sets etc to power relief centers and command and control facilities such as LGU units to coordinate relief operations etc. That is when I had an Eurkea moment. – we had in our disposal over 40 large 250w solar panels that can power communications gear, charge hundreds of cellphones, not use any precious diesel and have permanence- meaning it can run autonomously for weeks or even years with no resupply. Taking cue from my analysis of radio repeater installations in FOBs- Forward Operating Bases in remote harsh environments like mountaintops in Pakistan and Afghanistan and some experience I had in working with off grid solar in the United States for 3 years. We made and developed the SOLARIC ICD in 18 hours. Improvised Charging Device. Improvised because it was not a standardized build but made from an amalgration of parts that we had in our testing lab and even from the local CDR king and its main purpose is to Charge communication devices and even run 12v VHF radios direct from the unit. Our initial vision for Solaric was only to stay for the Grid tie ( no batteries) market for the homeowner or businessman to have an alternative to high Meralco bills but now was forced to come up with a system to power stuff, be man portable and capable to run without resupply or refueling. Our first on field deployment was a mere 6 days after Yolanda at a town called Medellin Northern Cebu. Completely devoid of grid power, our Cebu client graciously lent his panels and batteries to be used by the whole town. 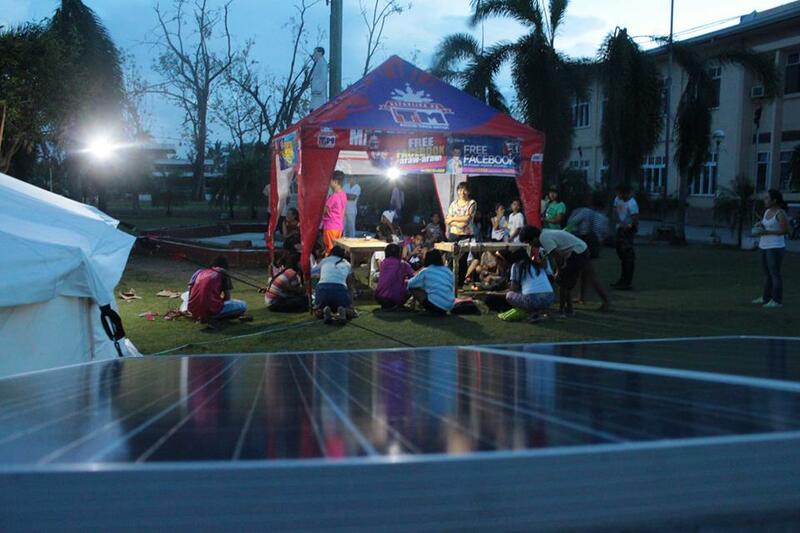 This was no exaggeration, the first Solaric OFFGRID v1.0 was placed in the town square of Medellin North Cebu. It was subjected to an endless line of people who came in to charge their cellphones so they can contact relatives. At night it was used to light up the town square with our first version of SOLARIC LED BULBS. over 120 people where charging their phones using our 500w charging station. Globe telecoms even used our facility for their libreng tawag program to charge up phones etc. In the meantime in Manila we were getting requests almost every hour to make more of those ICDs- they were funded by private people who wanted to make them available to church groups, government units, relatives, medical teams etc. Some units road aboard Airforce C-130s. others carried overland by the Land Rover Club. We worked overtime to produce those kits. We fabricated rails, mounting systems, testing how much load or stress we can subject units to and their breaking points. Some kits were solid, others failed prematurely because of component quality issues using a popular available brand known for cheap items. Inverters seem to be the weak link in Off grid builds. After shipping out more than a dozen kits sent to “frontline” units, I decided with my wifes reluctant permission to go to the most destroyed parts of the Philippines-Malapascua, Bantayan, with Ormoc and Tacloban as secondary objectives because peace and order was very dicey at the time. That was Nov 29. It took us 3 days to get our SOLARIC truck working as it was kept idle for many years and was borrowed from a relative who migrated to the states. When we reached Bantayan Island. it was a pitch black island. with massive damage. almost all roofs were destroyed and not a watt of electric power in any pole. far cry from the postcard vacation resort island North of Cebu. We rigged our truck with a 250W solar panel and a bank of batteries to provide us not only with 220v power but additional flood lamps because evening navigation is very dark and full of debris. We were to drop off a panel system to be installed in Suba Bantayan Island. It was a house that have been in the dark for three weeks. We got there late at night, but we did the install anyway. placed a 250w panel and a 500w inverter with 2 100ah batteries. this provided lighting for the whole house with more than 8 pcs of 5w LED bulbs plus capability to charge cellphones and laptops. 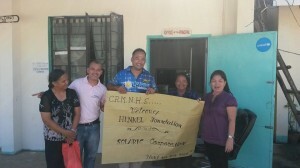 The following day we made a courtesy call to the Santa Fe Bantayan Island Mayor and presented our self contained system. He asked if he can “borrow ” the system so they can turn of their generators at night and yet still be able to communicate with the mainland by means of VHF two way radio. It is obvious that a lot of relief efforts were being done there and there was a contingent of German Engineers who was providing clean water to the people of Santa Fe. Without any expectation of getting paid we felt that they needed our system and left an ICD unit for them to use. Our next stop was to Malapascua to check out the damage there. Damage to the island was extensive with almost all coconut trees felled and ruined. It was flattened and the relief efforts were mainly bankrolled by the resort owners and expat community living there. We met with Anna Co Unijeng Reed and donated a unit so that her relief center can have electric power and use some electric powered medical devices. We also checked into our personal grant to another relief effort, a local Gary Cases, has hooked up a home water reverse osmosis machine to process questionable brackish well water to clean and good tasting drinking water with our solar system. For a small island, clean drinking water is everything. What made my day is seeing an elderly man use an electric nebulizer powered by a build that I made two weeks prior. this relief center was also a pioneering site for work for materials program, so hard working survivors can get the tools and building materials to fix their structures given that they fix up their neighborhoods and clear out the streets of debris. wonderful system and did a good job in keeping the abusers and moochers of scarce relief items. We then left Malapascua to go back to Cebu city for more supplies and do our cross over to Ormoc-Tacloban. Our trip to Ormoc was via the cement factory port in Danao-Isabel route. Cebu-Ormoc roro service was severely backlogged so we used a back door port to get to Leyte. This is when our Solaric truck got a nasty breakdown. At 3am from Isabel Leyte to Ormoc, our transmission broke and had to sleep literarily on the road. luckily we equipped our truck with a big off grid system. So had an airbed, mosquito lamp and electric fan. Following morning found a mechanic and brought down the transmission and repaired it in 3 hours. Next stop was in Biliran to check on the Provincial hospital that needed power. We ended up powering homes of people who needed electricity and a couple of doctors clinics. 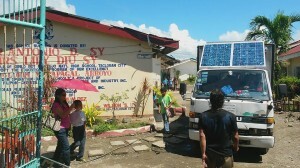 Biliran was not as badly damaged as the other areas. Then we were off to Tacloban. Tacloban….I called it the most destroyed city in the world, with Tanauan and Palo similarly damaged and obliterated. Whole ships were beached ashore, entire neighborhoods wiped out and temporarily lost my mind when I saw a mass grave of a whole family that perished- small infant children to grandparents. You know you are in an armpit of a place when you have to compete with WHO, UNDP, WFP, Red cross of ten other countries for scarce hotel space. I stopped counting after 18 countries who sent contingents there. 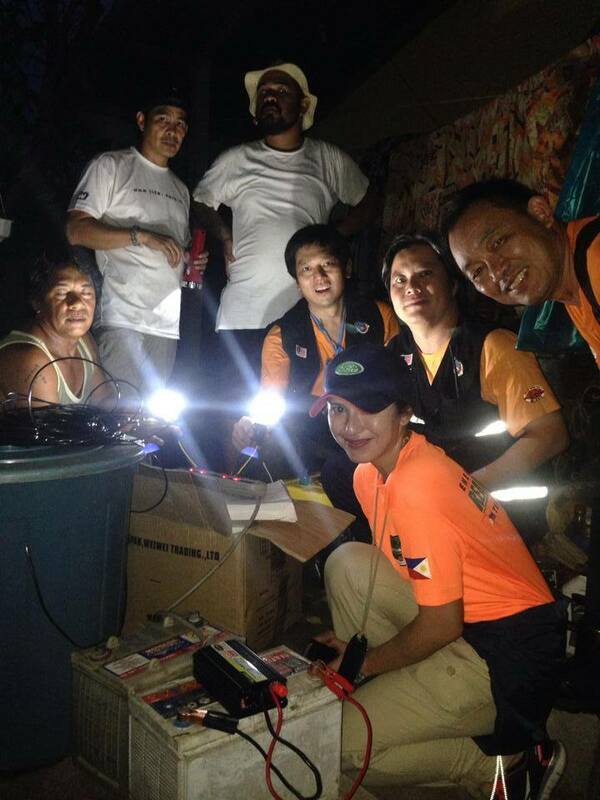 In Tacloban area we had a task list to deploy 5 ICDs in the area, Tanauan, Palo, Javier needed to get our ICD units. We also did our cousins house which was still under mud and muck. We called that house home for a few days and using the ICDs ourselves to run our phones and communications gear. How was living in Tacloban, well the air in Tacloban Dec 8-15 can be described as burning plastic plus the stench of dead rat. But we all knew its not dead rat but putrefying human corpses uncollected and under the wreckage and rubble. After a few days in operating under that environment, started to come down with a flu and also ran out of supplies-panels to install. So we headed back to Cebu but promised to come back again with more gear and reinforcements. We came back again on February, this time with triple the gear and crew. Our mission was to power two public schools using SOLARIC offgrid systems. 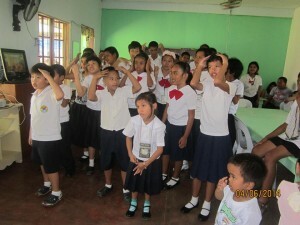 We took care of this and more we also lit up a geothermal power plant and maternity clinic in Biliran. To this day, Tacloban is still half without power after more than 120 days.